Registration software allows companies to automate the process of registration of events, meetings, conferences and also streamlines the payment collection process. Among all other things, this software helps organizations with ticketing, online or on-site registration, badge management, membership management and self-check-ins. With the help of this software, organizations can even conduct surveys and administer polls to gather attendees' feedbacks and keep their audience engaged. Online registration software lets your registrants go through registration process without any complications or confusion and that too very quickly. And, it makes the event management process easier than ever. Moving the registration online will save your money and time over the manual processes. Online registration software removes unnecessary and menial data entry. Do you want to increase your event audience? Obviously, yes, right! Online event registration software will help you increase the response rates and that too without headaches related to paper forms and spreadsheets. You can manage multiple events, registrants, and invitees. We have reviewed the 10+ best registration software. 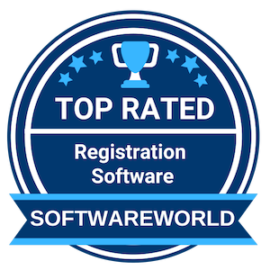 Take a look..
What are the Best Registration Software in 2019? About Cvent : Cvent, Inc., is a leading meetings, events, and hospitality technology provider with more than 3,200 employees, 25,000 customers, and 300,000 users worldwide. Cvent offers software solutions to event planners for online event registration, venue selection, event management, mobile apps for events, email marketing, and web surveys. Cvent provides hoteliers with an integrated platform, enabling properties to increase group business demand through targeted advertising and improve conversion through proprietary demand management and business intelligence solutions. “I have used cvent for over 15 years. It is constantly improving, has great customer support. Cvent saves so much time through automation of processes. We have more than quadrupled our capacity with same number of people” – Mary S.
About Race Entry : Race Entry was started by race directors and avid runners that were fed up with the lack of features and support they got, with the other registration players today. One day they had enough, and from that day have set out to build the worlds best system with the best customer service. Race Entry was conceived on the premise to save race directors their TIME, and produce more MONEY. “There are many registration platforms with very similar capabilities, what sets race entry apart is their customer service. Their ease of reporting especially comparing trends over multiple years is very nice and I really like the ability to create cross event discount groups that is not available on most other platforms.” – Gavin M.
About Ticket Tailor : Ticket Tailor is the most user-friendly online ticketing platform. We’ve built our business based on the simple idea that organisers shouldn’t have to pay large fees for ticketing their events. Our mission is to improve the lives of our customers. We’re super easy to use with loads of great features, integrating with Stripe, PayPal, Facebook and a myriad of other apps such as MailChimp. That’s why we’re used by thousands of event organisers across the world! About FamilyID : FamilyID is the leader in secure online registration for schools, camps, clubs, museums, studios and more. FamilyID takes a consumer-driven approach to transform the experience of registering for programs, schools, camps, clubs and activities. More than a million families use FamilyID’s online registration platform to sign up and pay for programs and activities. For camps, schools, museums or any other program provider, FamilyID is the easiest way to provide the convenience of secure online registration all in one simple, cost-effective solution. About Bizzabo : Bizzabo is the world’s first event success platform. It helps organizers create successful events by empowering them to build amazing websites, sell tickets, grow communities, go mobile and maximize event experiences – using a beautiful, user friendly platform. Bizzabo is used by thousands of conference organizers from around the globe. It’s available online and across iOS and Android devices. The company has offices in New York and Israel and was co-founded by Eran Ben-Shushan, Alon Alroy, and Boaz Katz. “Their software is simple and easy to use, yet robust and meets all of our needs. The sites are clean and modern looking. The app build is quick and seamless in how it works with the website, not needing to duplicate copy or set up a separate experience. This was a huge time and cost saver for us.” – Molly R.
About Team App : Team App is a FREE platform managing the communication and membership of any sporting club, team, association or social group. Team App is fully customisable, looks great, is easy-to-use and it’s FREE! Each Team App also gets its very own website version that updates dynamically with the smartphone. Team App was launched in April 2013, from which time it has achieved extraordinary growth and worldwide acclaim as the smartphone App of choice for any grassroots sporting club serious about real-time, mobile communication. “First, the product is VERY easy to set up. You can start with a very basic team app and grow it as need and time permits. The best parts is users love it, from players, to parents, to coaches. User adoption is king. Finally, you can customize it to the point it looks like a very professional app that is tailored to your needs.” – Eric B. About TeamSnap : Founded in 2009 and headquartered in Boulder, Colo., TeamSnap has taken the organization of youth, recreational and competitive sports into the 21st century. Fifteen million coaches, administrators, players and parents use TeamSnap’s web and smartphone apps to sign up, schedule, communicate and coordinate everything for the team, the club and the season. TeamSnap team, club and league management software makes organizing sports as simple as click, tap and go. “Very easy to use and lots of features that are helpful. I am a parent of a teen-aged athlete and have a hard time keeping up with her practice, game, and travel schedule. With TeamSnap all that can be put in one central place that’s easy to use. ” – Kit B. About myTRS : TRS LLC provides online volunteer registration and event management services with quality customer and consulting services. The Registration System is used by event planners, conferences, festivals, marathons, sports, hospitals, not-for-profits and many large events in the USA, Canada, Australia and Europe. “I enjoy the streamlined functionality of website creation without having to know and implement actual website coding. It’s really Easy, Flexible, and Concise.” – Savannah L.
About Weemss : Weemss is a software-as-a-service (SaaS) that changes the way event organizers handle event registrations and ticketing through an innovative new concept based on market localization and complete user independence. With Weemss event organizers can create, promote, sell, and manage their events in 200+ countries, with 160+ currencies and 40+ languages available. About Eventleaf : Create beautiful event websites with speaker profiles, agenda details, photos and videos, sell tickets and packages, create customized registration form, send and track invitations, promote event on the website and social media, print basic name badges as well as advanced RFID event badges, check in attendees, control access, track event attendance, register attendees online as well as on-site. About CONREGO : CONREGO is a SaaS Event Registration & Management Software loved and designed by Event Managers. It’s highly customizable to satisfy the needs of any event organizer. It includes a responsive website with a built-in registration form, a ticket sales module, and tons of other functions. CONREGO came to life in 2010, in order to provide event organisers with a set of solutions that support the implementing of the most time-consuming and costly processes. About Eventboost : Eventboost is an innovative event management system enabling event professionals all over the world simplify guests management complexity before, during, and after any events. Our platform has been designed to allow event organizers and marketing specialists to increase event attendance while maximizing efficiency and event ROI. We help save time, stress, and budget when organizing corporate meetings, conferences, forums, conventions, training, exhibitions, fairs, trade shows and much more. » Event Management Software - Event management software is the generic name for a wide range of software that is involved and used in management programs of corporate and other conferences. These businesses include trades, seminars, corporate meetings, exhibitions, academic shows, academic conferences and other basic and smaller events.